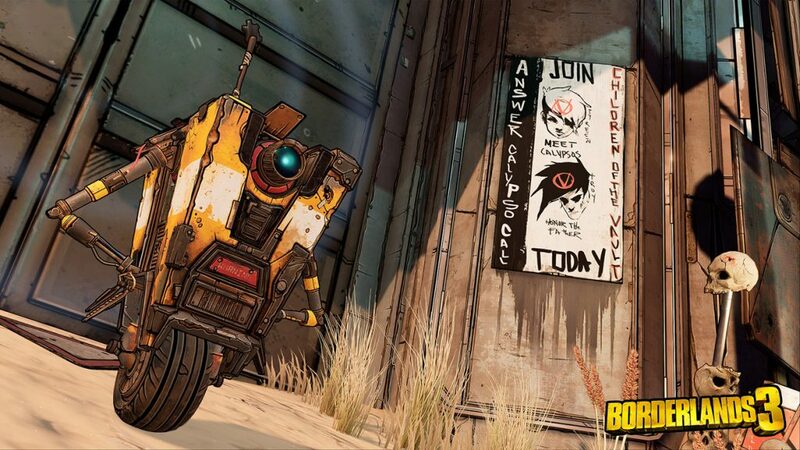 Gearbox Software has released a new trailer for Borderlands 3. It is the third trailer we got so far. Moreover, we got the game’s release date: September 13, 2019, which is a lot earlier then we expected. Moze – The new Gunner class with the ability to instantly construct a mech by the name of Iron Bear when she needs some additional firepower. Amara – The new Siren character is much more melee-focused then her sisters, with the ability to summon ethereal crushing arms. FL4K – The game’s Beastmaster, always accompanied by his pets: a Skag, a Spiderant, and another unknown creature. Zane – The retired Assassin, who can cause a lot of mayhem with his gadgets, support drone and decoy clones. Each hero has its own unique set of abilities and special skill trees. Of course, they also have a near-endless arsenal of a billion weapons. The iconic weapons from the previous games are back, and their manufacturers too. There would be new additions to the known arsenal with unique special attributes for each company. Atlas will provide you with special guns equipped with bullet tracing and smart programmable bullets, DAHL will provide different firing modes, and MailWan specializes in switchable element effects for your weapon. Do you want something new? Something crazy? Something odd? You got it! 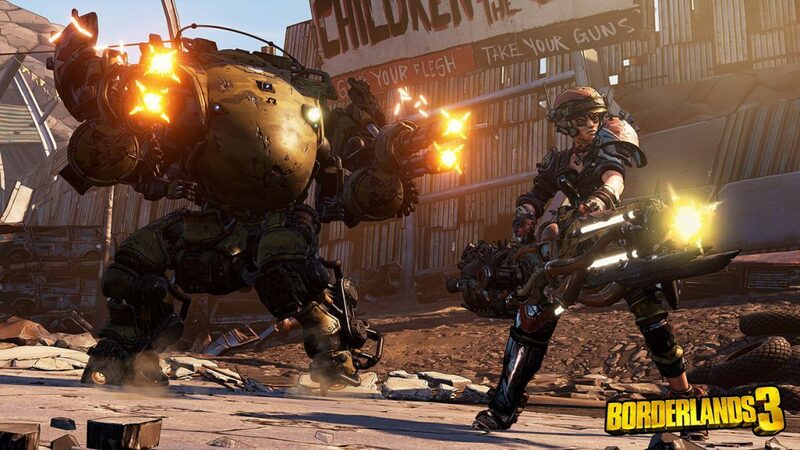 From guns that spawn volcanoes to guns that grow legs and start chasing the enemy while cursing at them – Borderlands 3’s arsenal is pretty wacky. This is just the tip of the iceberg, as the developers promised a lot more guns; more than a billion, to be exact. The new trailer gives us a glimpse of the many different enemy types we will encounter, including the main bad guys – The Calypso Twins. They plan to unite all the bandit clans under one banner in an attempt to get their hands on the strongest power in the galaxy, which will grant them the ability to destroy everything. The chase after the twins will take you to other plants besides Pandora, and there would be plenty of different enemies to defeat along the way. 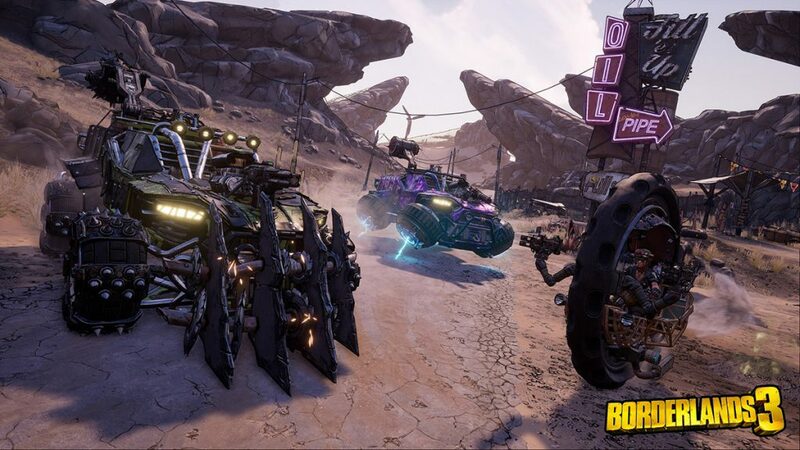 According to Gearbox, they are going to present the first gameplay video of Borderlands 3 on May 1. Until then, you can spend your time playing the older games, that are all readily available in 4K. The Handsome Collection bundle is still available at a very low price for PC via Steam. 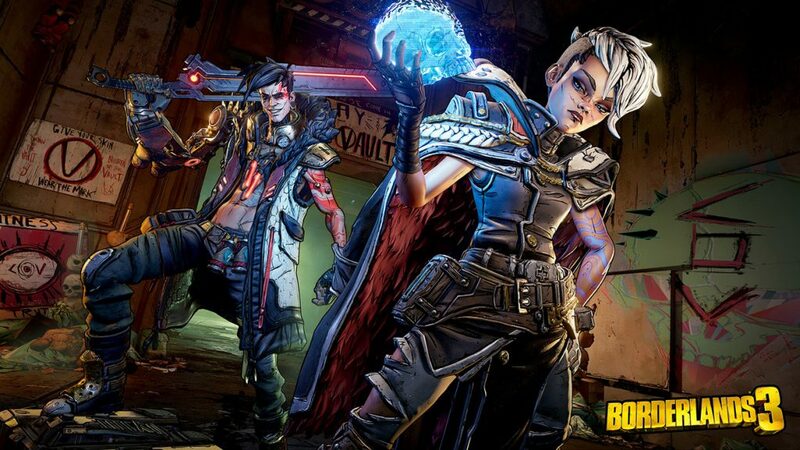 Borderlands 3, would be available for the PC, PlayStation 4 and Xbox One. 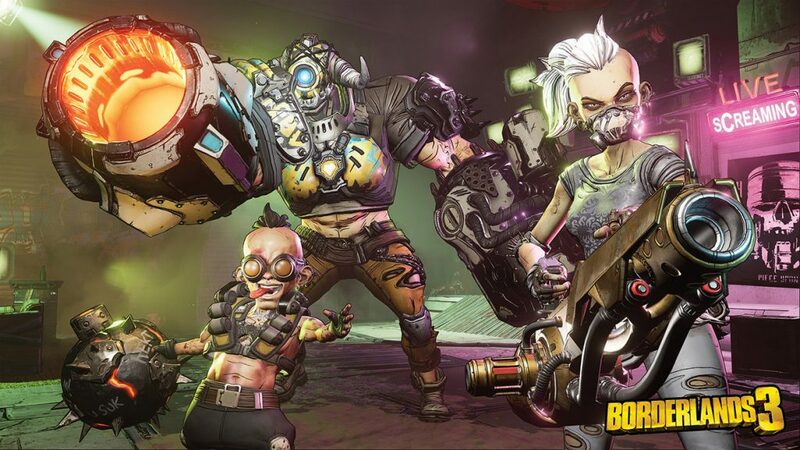 On PC, the game will be exclusive to the Epic Games Store for the first six months, but the developers say they are working very hard so that Borderlands 3 would support cross-platform play, which is really exciting. Epic Games already support cross-platform play in Fortnite, so Gearbox’s decision to go with Epic’s store may be somehow related to that. You can already pre-purchase the game through the Epic Games Store, with three different editions to choose from. Console players can pre-purchase the game their console’s digital store. 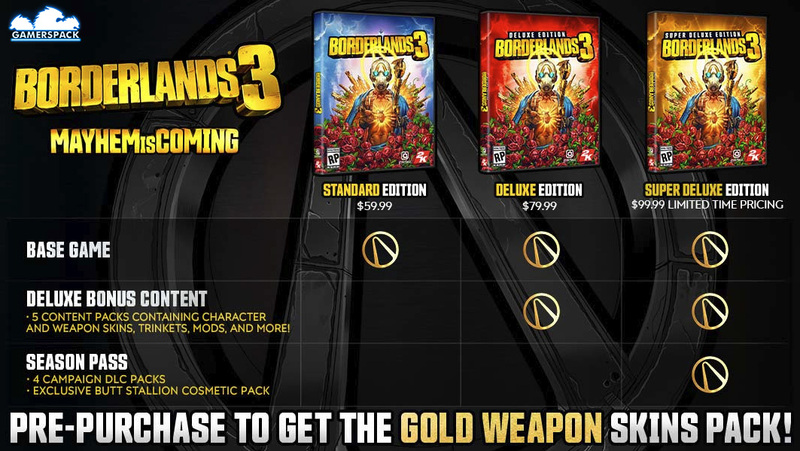 Pre-purchasing any edition will give you access to golden weapon skins pack. Standard Edition ($60): Include the base game only. Deluxe Edition ($80): Includes the base game, five content packs, skins for characters and weapons, mods and more. 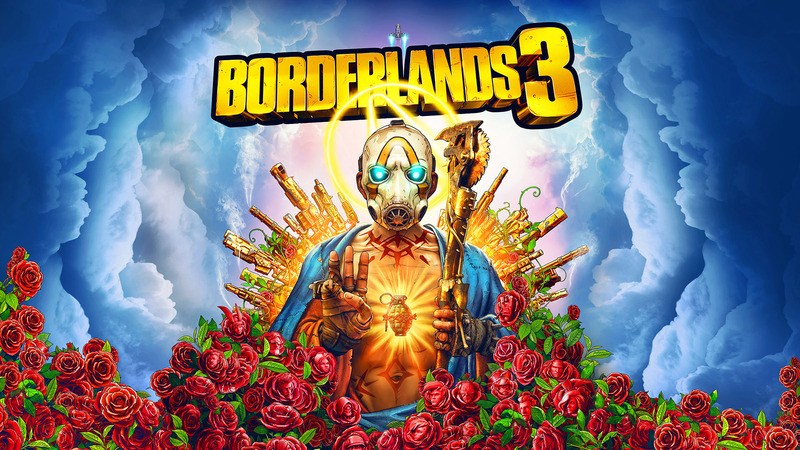 Super Deluxe Edition ($100): Similar to the Deluxe Edition, but also includes the Season Pass that will have four different DLC packs and many other challenges. 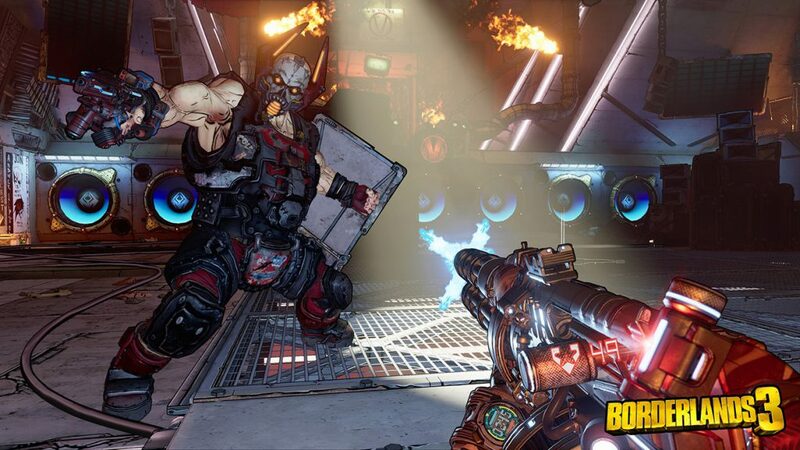 Borderlands 3 will be available on September 13, on PC, Xbox One and PlayStation 4.